Cold weather, Whisky, Christmas. Natural companions? 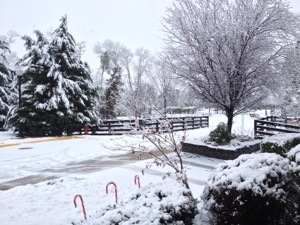 The winter of 2014 has really moved into the North American continent and it has brought a special gift for the Mid-Atlantic region. For those of you unfamiliar with the East Coast of the United States, the Mid-Atlantic region’s center is Washington D.C. For a couple of years we have had mild winters which of course has festered the “global warming” ilk to wail our incoming doom (if you live in the DC area you get sick of hearing special interest groups regardless of their cause). Prior to the warm winters we had three feet of snow in a week. Go figure. This year we’ve had a couple of snows already and every day when I check the weather I see how consistently colder it is here than it is in Glasgow, which doesn’t seem right? I love this promotion! The 18 year product is a “must try before you die” whisky. So winter weather, and it’s by-product snow, seem to be a natural setting for good whisky. 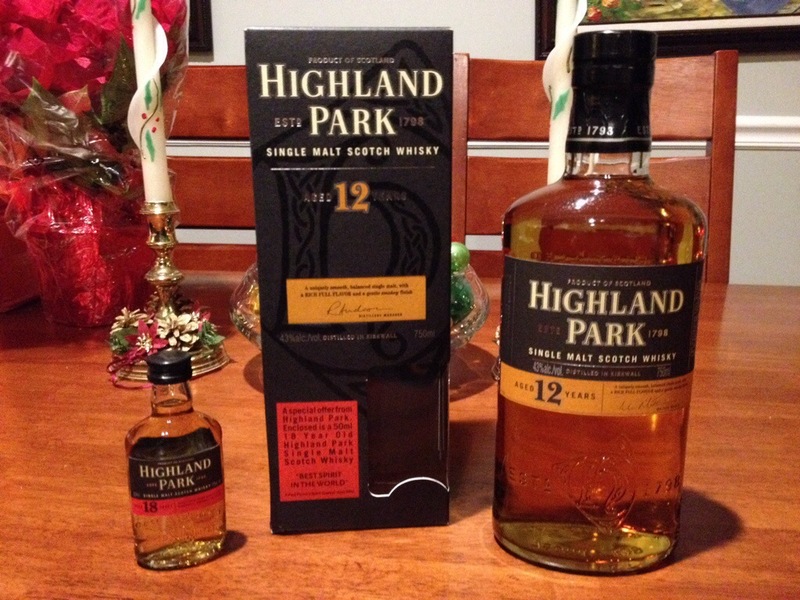 The other day I picked up a bottle of Highland Park 12 year that is being sold with a small bottle of the Award winning 18 year Highland Park whisky. The fact that the 12 year was on sale was good enough reason to buy it and to see the 18 year teaser bottle as a bonus sealed the deal. I had to quickly snap some pictures with the iPhone because I could not resist opening the bottle. 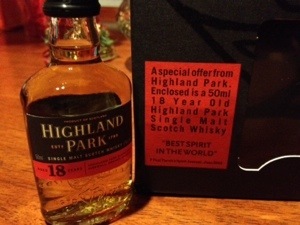 There is something irresistible or just natural about the Highland Park bottle. It makes you want to open it. I was going out for the evening but wanted to take a sip just to reacquaint my palate with the spirit. Delicious. This really is just a remarkable product. It’s what whisky should taste like and there really, to me, isn’t another type of spirit offering that gives you that immediate confirmation. The folks at Highland Park Distillery can, as marketing logically goes, brag that they are the northern most distillery in Scotland. They do seem to be in a micro-climate that seems to bring little variation in temperature. No, it never gets hot there, like in Washington D.C., nor does it see -8c temps like just two nights ago here in DC. But a very naturally steady cool temperature that seems to aid in producing an excellent whisky. In Islay, you have wild temperature/weather swings (I’ve witnessed this first-hand) and I think it is fitting the type of smoky-peaty whisky that is largely produced on that Island. If you know Kentucky, you really have to reflect on the fact that the climate there is so remarkably different than in Scotland. Bourbon as well as other American whiskies are subject to wild temperature extremes in storage from 90f+ down to -32f degrees (0c to 32c for you folks outside the US). Scotland’s geographic placement puts it into a constantly cool environment which in my personal opinion and affinity for the Scottish spirit is superb. What also is superb is this 12 years aged single malt Scotch whisky. I had to check to see if I had written about the 12 year before and what I found is that I haven’t, but wrote about the 15 year product (which is a cousin to the 12, but not an older brother) almost to the date, one year ago. Another naturally occurring phenomenon? Whatever the case, this Highland Park 12 product is remarkably smooth, gentle on the nose and despite its rough Viking ladened marketing programs (which is for some of their other HP products but still misleading) quite the gentleman on the palate. This is a “no-brainer” whisky, it simply must occupy your cupboard from time to time, especially at Christmastime! Naturally.